WASHINGTON — The Washington Mystics’ 2018 season opened Sunday at Capital One Arena in front of 7,400 enthusiastic fans, who cheered the home side to a near wire-to-wire, 82-75 victory over the Indiana Fever. While that attendance number is often an afterthought, a new leaguewide initiative by the WNBA means that in their home opener alone, the Mystics raised $37,000 for women and girls empowerment programs. For every ticket sold to every game in the league this season, the WNBA will donate a free ticket to a young woman as well as $5 to one of six charitable partners the league has partnered with: Bright Pink, MENTOR, GLSEN, The United State of Women, It’s on Us, and Planned Parenthood. Through the Take a Seat, Take a Stand program, fans can choose which organization they’d like their money to go to. It’s a substantial and impressive commitment from a league that has positioned itself as perhaps the most forward-thinking professional sports league in America. Considering the WNBA drew 1.57 million fans last year, there is potential for real change through their investments. Players often drive initiatives in the league in a way you don’t see in other professional leagues. When league president Lisa Borders presented the music for their Watch Me Work initiative, Dallas Wings guard Skylar Diggins-Smith vetoed it. When Borders challenged Diggins-Smith to come up with something better, she delivered the music the league ended up using. Similarly, the idea to live stream games on Twitter came from Seattle Storm guard Jewell Lloyd. The league is currently in the second of a three-year deal to live stream 20 games per season on the social media platform. “Women who are playing it should have insight into what makes it tick, what makes it fun, what makes it exciting,” Borders told Bram Weinstein on a recent episode of the SportTechie Podcast. Delle Donne said this idea was all Borders, though. As the initiative was only rolled out a few days ago, Mystics GM and Head Coach Mike Thibault told WTOP that he hasn’t really had a chance to chat about what it means yet with his team. 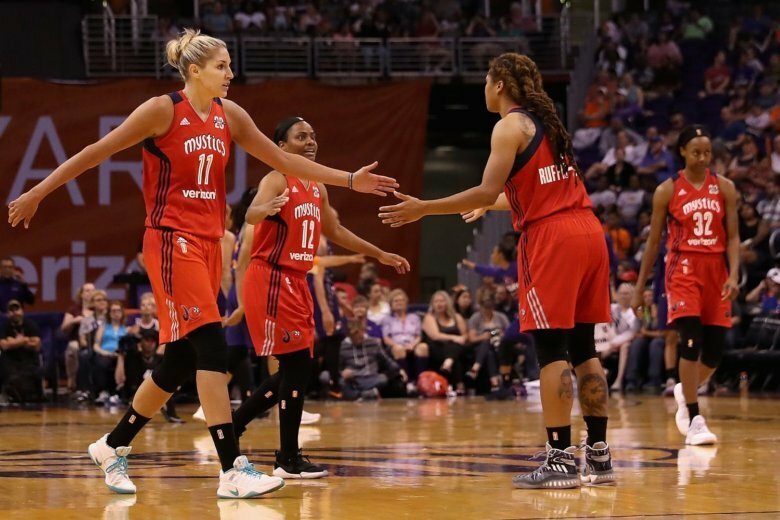 But the response was overwhelmingly positive in the Mystics’ locker room Sunday. The University of Maryland product, now in her 10th year in the WNBA, sees the chance for others to look at what her league is doing and potentially bring about change on an even larger level.